Wesley House Cambridge is pleased to announce a new partnership with Africa University Zimbabwe. Sponsored by the Central Conferences Theological Education Fund of the United Methodist Church and the Innovation Fund of the General Board of Higher Education and Ministry of the United Methodist Church (GBHEM), Wesley House and Africa University will work together to deliver a doctoral programme in Methodist Theology for 12 African theological educators. The partnership is also designed to build the capacity of Africa University for the delivery of higher degrees and research in contextual theology through its new Institute of Theology and Religious Studies. 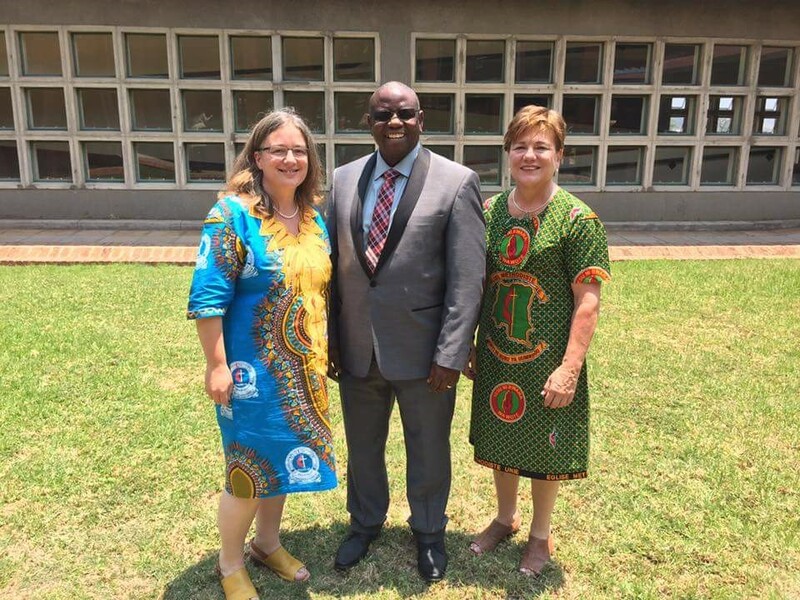 The Principal, The Revd Dr Jane Leach (left) is pictured here with the Vice Chancellor of Africa University, Dr Munashe Furusa and the General Secretary of the General Board of Higher Education and Ministry, The Revd Dr Kim Cape (right). Recruitment will begin after Easter to identify suitable Methodist theological educators working in African theological institutions. It is a five year programme, beginning with an Advanced Postgraduate Certificate in Theological Research, that will enable students to continue to teach in their own contexts whilst studying part time. Learners will travel twice a year to Africa University to meet with their peers, learn research skills, discuss theological concepts and insights from other disciplines and work together with staff from Cambridge and from Africa University. After the first year each student will work with at least two supervisors – one from Cambridge and one from an African context. Each student will spend a three month period on study leave in Cambridge during the course of the degree and return to Cambridge towards the end of the programme to finish their dissertation. Students will need the support of their bishop and of their theological institution to engage in the programme and a useful research proposal that can be developed as a doctoral project. The PhD programme is part of a series of innovations at Africa University to promote research and the contextual study of theology in Africa in the service of church and society. Wesley House staff will be working with Africa University staff to expand the concept of the Institute, to recruit a Director for the Institute and to facilitate staff development.